CRIES of ‘Viva Espana’ look set to reverberate around the southside this month as the newly-opened La Vida Tapas Bar at 1901 openly declares its support for Spain to conquer all, including England, at this month’s Euro 2012 UEFA European Championship. So whilst fans of the beautiful game are being urged to get back to 1901, the quality gastro pub in Glasgow’s southside, to follow all the Euro 2012 matches, they should be prepared to encounter some obvious in-house partisan support for Spain from bar and restaurant staff – as well as fellow punters. That’s because 1901 regulars have developed a taste for La Vida’s traditional Catalonian and Spanish-inspired cuisine, and, together with staff, have fallen head over heels in love with all things Spanish. Which is why La Vida is installing a TV so that diners can cheer on Spain whilst they enjoy their tapas. 1901 and La Vida manager, Patrick Stapleton, said: “We’re all rooting for Spain to win Euro 2012. But regardless of who wins, we’re all hoping for a great championship. With the championship kicking off tomorrow (Friday 8th June), all the games will be screened at 1901, though La Vida staff will likely be most vocal in their support for Spain’s games in Group C: kicking off at 5pm against Italy on June 10th; 7.45pm against Ireland on June 14th and 7.45pm against Croatia on June 18th. 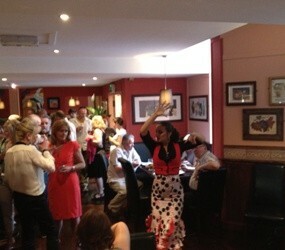 La Vida features live Spanish music every Saturday night from 8pm, with flamenco dancers bi-weekly. Every Thursday night is fiesta night with traditional paella cooked in the centre of the restaurant, comprising two of the chef’s choice tapas to start followed by a plate of paella and sangria to wash it all down for only £12.95 per person.